Rubenstein School student Kevin Ostrander learned to use radio telemetry to track collared sage grouse during a summer research internship on the sagebrush steppe of Wyoming. Kevin Ostrander ’20, a junior in UVM’s Rubenstein School of Environment and Natural Resources, is accumulating research and work experience through exciting opportunities studying western game birds and leading career-building activities for other undergraduates. He also has enough credits, from high school AP courses and 17-credit semesters, to graduate a year early. But, Kevin, who is double majoring in Wildlife and Fisheries Biology and in Environmental Sciences, plans to further his excitement for learning in advanced classes during his senior year. “I want to take advantage of all four years and get in some upper-level courses,” he says, with his sights set on graduate school. He paired his wildlife curriculum with a conservation biology concentration in the Environmental Sciences program because it combined his passion for wildlife and his drive to learn all he can about habitat restoration and conservation. He also joined the student chapter of The Wildlife Society – a UVM club – and became event coordinator and now president. Early involvement in the chapter and networking through Jed, who connected him with a former student, helped to single Kevin out for a summer internship after his first year. He interned with Rubenstein School wildlife and fisheries biology alum Josh Leonard ’12, a PhD student studying sage grouse brood success at the University of Wyoming. 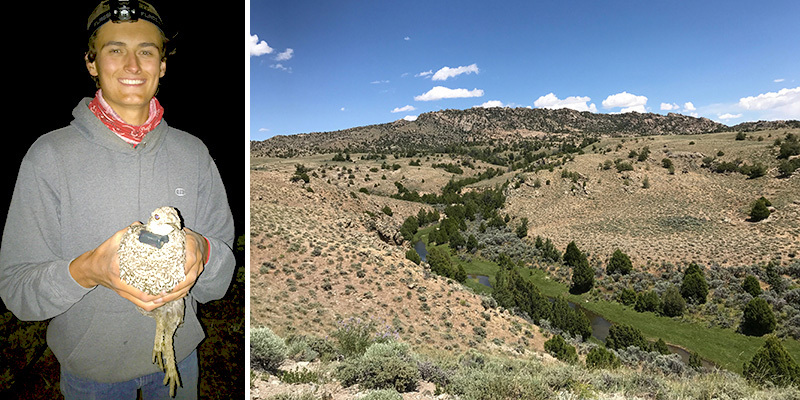 Kevin roamed Wyoming’s vast sagebrush steppe, tracked 120 radio-collared hens to monitor hen and young survival, and conducted vegetation surveys to help better understand grouse habitat. “Sage grouse nest beneath sagebrush and lay ten to twelve eggs of which an average of six to eight survive to hatch,” says Kevin, who learned all there is to know about sage grouse and the field methods used to study game birds. He gained experience collaring hens, operating radio telemetry, driving off-road vehicles, and working alone on the expanses of public land surrounding remote Jeffrey City, population about 50. His experience and newfound talents led to a position the following summer on a research project with South Dakota Game, Fish and Parks. Kevin applied his expertise in radio telemetry to monitor wild turkey hens, nests, and young on expansive agricultural lands. His background in hunting and fishing helped in his conversations with landowners when requesting permission to conduct research on private lands. Kevin brought his skills back to Vermont to share with other wildlife students. Together with Jed’s graduate students, who are tracking and monitoring radio-collared moose populations in Vermont’s Northeast Kingdom, Kevin will lead a Wildlife Society chapter workshop on radio telemetry for undergraduates. He organized other annual chapter activities including a visit to Vermont’s Missisquoi National Wildlife Refuge to learn about refuge operations with manager Ken Sturm ’92, a UVM wildlife and fisheries biology alum. Kevin also coordinated with Vermont State deer biologist Nick Fortin to arrange student help at Vermont deer check stations during the November hunting season. “The club helps students to get experiences they don’t get in the classroom and make connections with graduate students and professionals in the field,” says Kevin.